Thanks to FootCameroon, you are able to view short videos from the MTN Elite One 2010-2011 in Cameroon. One player that has caught my eye through this videos is the in-form striker Frédéric Nguidjol from Canon de Yaoundé. Nguidjol has scored at least six league goals so far this season (I am still not able to find the scorers from the match between Canon and Caïman on 05.06.2011. Canon won 3-2) and has been one of the revelations of the season. My first record of Nguidjol is from 2006 when he was part of the Cameroon U-17 national football team. At the time, Nguidjol was playing for Renaissance FC de Ngoumou, apparently at third level of Cameroonian football. I have checked the other players in the Cameroon U-17 squad and have found players born in 1989, 1990 and 1991. Therefore, it should be fair to conclude that Nguidjol is in his early twenties. Nguidjol joined top club Cotonsport FC before the MTN Elite One 2007, which had to be a dream come true for the talented youngster. Nguidjol was a fringe player during the season, but still managed two league goals. Nguidjol failed to break through at Cotonsport FC and scored only one league goal the next season, the MTN Elite One 2007-2008. It is difficult to find information about Nguidjol whereabouts during the MTN Elite One 2008-2009 but according to Camfoot, he signed for Union de Douala before the season. I don’t think Nguidjol played an important role at Union de Douala and according to Fecafootonline, he failed to score for his new club. To revive his career, Nguidjol joined Tiko United FC before the MTN Elite One 2009-2010. It is very difficult to find information about his performances at Tiko United FC. Despite some difficult seasons, Nguidjol has cemented his place in the first team of Canon de Yaoundé after some great performances in early 2011. The first goal is a beautiful shot from about 20 meters against Scorpion FC de Mbe on 30.03.2011. The second goal shows his speed and determination. The goal is from the match against Renaissance FC de Ngoumou on 30.01.2011. The third goal again shows his speed as well as a very clinical finish from a different angle. The video is from 17.04.2011 and the game between Canon and Unisport FC. 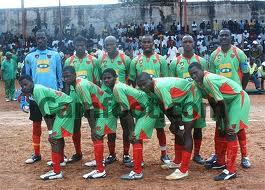 The picture of Canon de Yaoundé is taken from worldfootball.net.